Insa-dong (인사동, 仁寺洞) is a neighborhood (also called a dong) of Jongro District, Seoul, South Korea. 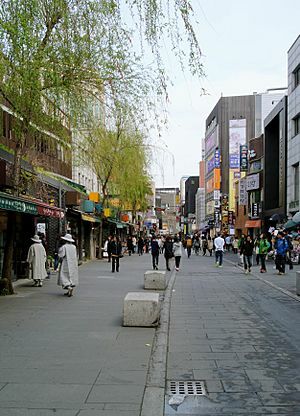 The main street is Insadong-gil, which is connected to many alleys that lead deeper into the district. Insa-dong is a popular tourist spot in Seoul. It is mainly one long street, and is known for its many art galleries, restaurants, and shops that sell traditional Korean items and art. There is also plenty of street food and sometimes there are public performances of dancing or a traditional display of criminals. Winding side streets are home to a variety of traditional restaurants. Insadong Facts for Kids. Kiddle Encyclopedia.